PHOENIX – Now that the Buffalo Bills have a bunch of new players, someone has to get them to mesh as a team. This is where Sean McDermott and the rest of the Bills’ coaching staff takes over. It won’t be an easy job, considering that of the 15 players the Bills have added via unrestricted free agency and potentially another 10 they will be adding in next month’s NFL draft, several of them figure to be starters. The offensive line, for one, is likely in for a major rebuild. 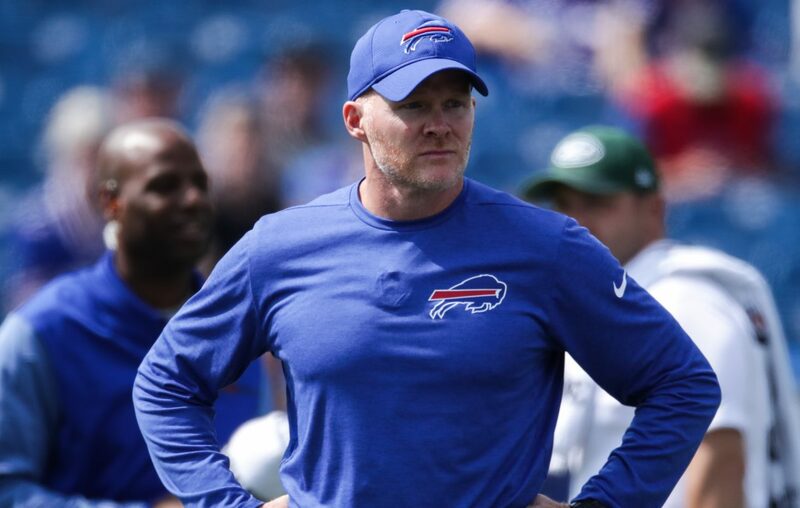 "The less continuity you have, the bigger the challenge, right?” McDermott told reporters Tuesday during the annual coaches breakfast at the NFL meeting at the Arizona Biltmore. “So it's a challenge to bring guys together that are coming off of different teams in particular with how heavy we went free agency. That's some of the risk of free agency, inherently. "That said, we needed to improve our football team from a roster standpoint. So that's also why you do the research that (General Manager) Brandon (Beane) and his staff did, (assistant GM) Joe Schoen, and so on and so forth, to try and close the gap as much as possible when it comes to knowing the players in free agency. It's a slippery slope, the process of free agency, but again, we tried to go with our critical factors of what we feel like to close that gap as much as possible." But it’s a balancing act. On one hand, the Bills want to believe they’ve already become significantly better with their free agent signings. On the other, they have the enormous task of figuring out how to get maximum impact from them as quickly as possible. "Listen, I'm grateful for the opportunity that we had to add those players,” McDermott said. “I mean, the (available salary) cap money this year, the cap money last year, two different scenarios, right? So those were necessary, going through some of that just trying to be judicious with how we handled it the previous years because we really didn't have a lot of flexibility. Or we could have just taken an irresponsible approach and just kept kicking it down the road and that's not how you build it. "So we took this year and said, ‘Hey, now we have a chance, some flexibility to spend, and let's not just spend irresponsibly, but let's target the guys that we feel like that are out there that can help us.’ You can only target what's out there, right? So now you say, ‘OK, now we've got these guys, these names on the paper. Well, how do we bring them all together and form a cohesive team?’ And that's the challenge every year, in particular, when you're building it, where there is a significant influx of new people. "In free agency, when they're coming from different locker rooms, sometimes they pick up good habits and sometimes, just the nature of being a veteran, you pick up habits that aren't so good. So the important thing is that we take a team-first, selfless approach to basically our journey this year." McDermott said he felt that, overall, the Bills acquired players who “fit our DNA.” However, his optimism included some caution. The Bills plan to release 31-year-old running back Chris Ivory, per a report from ESPN’s Adam Schefter. The move would save the club $2.15 million against the 2019 salary cap, while costing $750,000 in dead cap money. After the Bills signed Ivory last year, he proceeded to average only 3.3 yards per carry on 115 rushing attempts. he has not averaged more than 3.8 yards per carry since the 2016 season. Vic Carucci – Vic Carucci covers the Bills and NFL for The News. With four decades of experience as a pro football writer and broadcaster, he is a co-host on SiriusXM NFL Radio and a Pro Football Hall of Fame selector. Vic has authored 10 books about football (including multiple New York Times best-sellers) and is a past president of the Professional Football Writers of America.